You want to make an infographic and need the useful and convenient drawing tools for this? In this case the ConceptDraw DIAGRAM software extended with Education Infographics Solution is a real godsend for you. ConceptDraw DIAGRAM lets the possibility to make an infographics in new blank document or use the predesigned template or sample as the base. If you want to use the predesigned template or sample, choose it from the offered set in ConceptDraw STORE. You are able to use it as is or change for your needs. 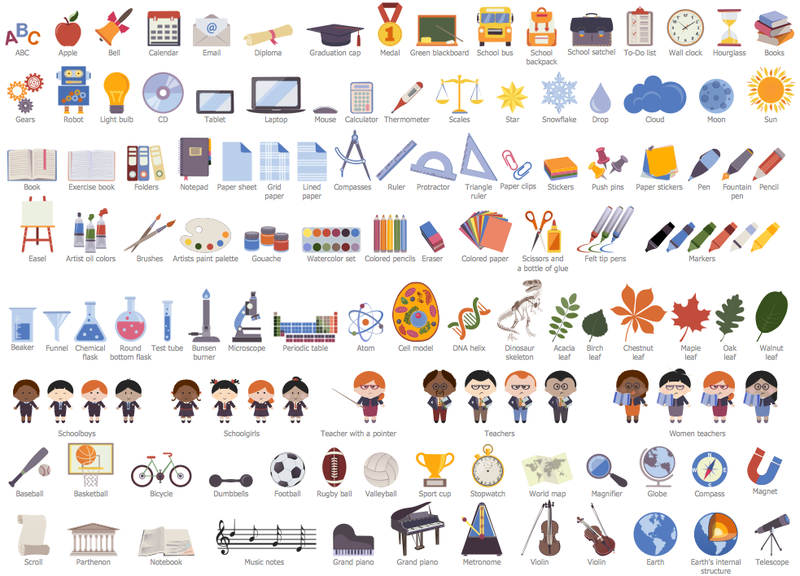 All predesigned objects from the Education Infographics Solution libraries are bright, colorful and attractive, and are able to decorate and to make professional looking and successful any educational materials. Use Education Infographics Solution for ConceptDraw DIAGRAM diagramming and vector drawing software to make an infographic for any thematic without efforts. Make them quick and easy, and then successfully use in the learning process. All source documents are vector graphic documents. They are available for reviewing, modifying, or converting to a variety of formats (PDF file, MS PowerPoint, MS Visio, and many other graphic formats) from the ConceptDraw STORE. 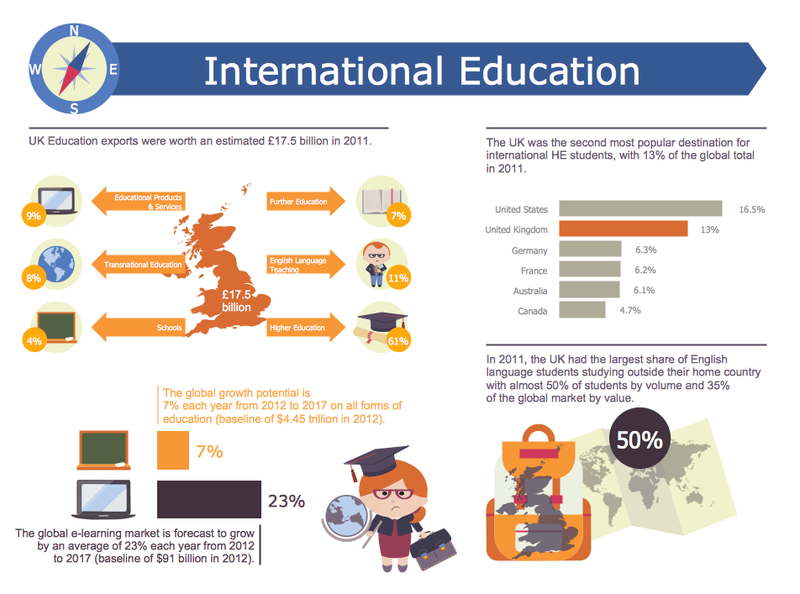 The Education Infographics Solution is available for ConceptDraw DIAGRAM or later users. What are the favorite educational technology tools and techniques for teachers? Of course these are pictures, images and education infographics! ConceptDraw DIAGRAM v12 software supplied with Education Infographics Solution from the Business Infographics Area provides powerful drawing tools to help design the education infographics of any complexity. How to Make an Infographic quick and easy? The perfect way is to use the ConceptDraw DIAGRAM v12 diagramming and vector drawing software extended with Education Infographics Solution from the Business Infographics Area. 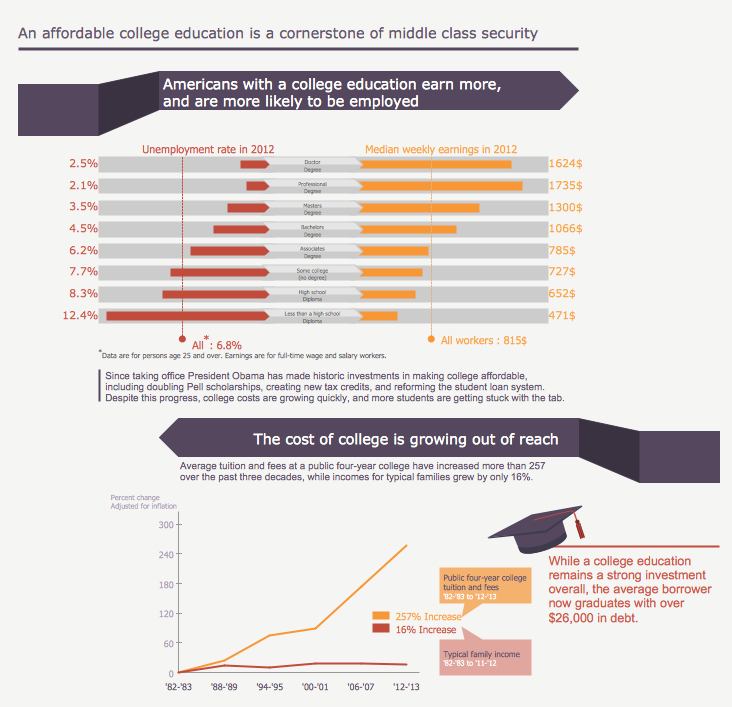 The Education Infographics are popular and effectively applied in the educational process. Now you don't need to be an artist to design colorful pictorial education infographics thanks to the unique drawing tools of Education Infographics Solution for ConceptDraw DIAGRAM v12 diagramming and vector drawing software.